Professor Doctor Anwar-ul-Haq Ahadi son of Qazi Abdul Haq was born 12.08.1951 in Jigdalai, Sarobi District (Nangahar). He earned his Bachelors and Masters Degrees from the American University of Beirut in Lebanon in Economics and Political Sciences. He is one of the "Beiruti Boys". That is a group of Afghans who studied at the American University in Beirut and had been living in the USA later. In this group were also the President of University of Kabul, Akbar Popal (2001–2005) and Zalmay Khalilzad, an Afghan by birth, who was later Special US Envoy in Afghanistan and from 2003 to 2005 US-Ambassador in Kabul. Ahady has also earned a professional Masters degree in Fiscal Affairs and Management from the post-graduate faculty of North Western University and has then earned PHD in the field of Political Sciences from the named University. Dr. Anwar-ul Haq Ahadi has served as assistant professor of political sciences in Carlton University of the USA, from 1985-1987 as the banking director of Continental Elona of Chicago, from 1987 to 2002 as professor of political sciences in Providence University, and from 2002 to 2004 as the Director of Da Afghanistan Bank (Central Bank of Afghanistan), as the Minister of Finance from 2004 to 2009. He resigned in 2009 because he was a candidate in the Presidential Elections in August 2009. He has many writings in academic journals, books and popular dailies of the US. Dr. Anwar-ul-Haq Ahady is the president of the Afghan Social Democratic Party (also known as the Afghan Mellat Party). Ahadi has personal connections to Pamir Air, a dubious private airline. 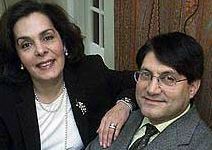 Ahadi’s wife is a cousin of Jawid Azimi, a former President of Ariana. Azimi and a notorious member of the Afghan drug mafia made private deals with a shady Arab businessmen with ties to airplanes when Azimi was president. The two profited from planes that were sold to Ariana at high prices. Today, Azimi and his mafia friend are major partners of Pamir Air, a direct competitor of Ariana. His Afghan Millat Party is famous for its ultra Pashtun ethnocentrism but it denies the perception and claims that the party has a comprehensive national agenda. Afghan Millat has good support among the Pashtun liberals and educated class. But Dr. Ahady’s misfortune is that the class does not have any decisive role for the time being in shaping Pashtun politics. Ahadi was divorced from his first wife later married Fatima Gilani, daughter of Pir Ahmad Gilani. Ahady got no vote of confidence from Wolesi Jirga as a Minister Economy on 20100109. On 20100628 he got a vote of confidence as a Minister of Commerce an Industry. New National Front Afghanistan chief Anwarul Haq Ahadi has joined forces with presidential candidate Dr. Abdullah Abdullah’s electoral team, sources said on Thursday Apr 4, 2019. Ahady owns a big house in the USA. Afghan Mellat (Afghan Social Democratic Party) Leader: Anwar al-Haq Ahadi Postal Address: National Bank Club, 3/F, Nader Pashtoon, Jadah, Kabul, Afghanistan Telephone: 070224793, 07992185991.